It won’t solve congestion in the city: Council surveys and data show 80%+ of current traffic is within, or coming into and out of, the city. Much of this is school traffic: far less congestion in half-terms and holidays. Most HGV traffic is also coming into and out of the city and is not through traffic. 6,500 new homes by 2031 will only mean more local traffic: the project consultants (WSP Group) have admitted, in a public meeting, that city traffic will increase even with a bypass. It won’t be cost-effective: In 2010 a single carriageway road would have cost £175 million. So the dual carriageway, if built, with a 300-metre span high-level viaduct across the Wye would now cost well over £250m. A49 journey times will be reduced by less than 8 minutes. The city’s congestion problems could be solved for a fraction of this cost. It will destroy special landscape, high-grade farm land and homes: The River Wye is a Special Area of Conservation, the highest European level of protection, and SSSI. Unspoiled Breinton is a vital ‘green lung’ asset and amenity for city residents. Homes are under threat of demolition or major noise and pollution impacts. Grade 1&2 farmland, the setting of Belmont Abbey, ancient woodlands and historic orchards are all under threat. …and it’s not even a bypass: All 7 routes pass through the planned 1,500 new homes site at Three Elms, and inside the city boundary. 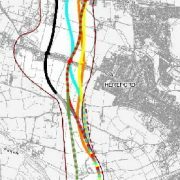 Council needs developers’ money to help fund the road, but also expects the new road to become the ‘trunked’ A49 so it can then ‘own’ the current trunk road in the city. But the Dept for Transport does not normally permit a new trunk road through, or next to, housing. Solve city congestion with. . .
More mini roundabouts and fewer traffic lightsAll this would. . .